For this episode of the Book Vs. Movie podcast the Margos go back to the world of science fiction with this ep talking about the extraordinary life of Isaac Asimov and his most famous work (out of hundreds of books, essays, letters, etc.) I Robot. 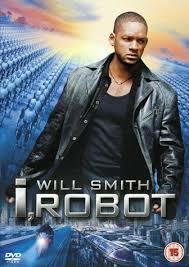 Specifically we compare the introduction of the book and the short story Little Lost Robot with the Will Smith 2004 film. So how does the movie compare to the source material? We discuss and decide in this ep (the hyperlink is at the end of the post) and choose our preferred at the conclusion of our show. The incredible life of the author. How the character of Dr. Susan Calvin is presented in the books versus the movie. The amazing performance by Alan Tudyk as Sonny. If the special effects hold up or no. This entry was posted in Podcast, Uncategorized and tagged "Book Vs Movie I Robot", Book Vs. Movie podcast, Isaac Asimov I Robot Book Vs Movie by brooklynfitchick. Bookmark the permalink.